The many and various rectors of Eversholt are a subject of endless fascination. More have recently been unearthed by the increasingly well-informed Clergy of the Church of England Database. That records official events noted by the church – appointments, deaths, dismissal and the like. Some event records are missing, so a rector’s death may be noted without a record of appointment. Appointing a rector is complicated. First the candidate has to be presented, meaning that the owner of the advowson has to recommend the candidate for the post. The advowson is just the right to propose the candidate. The advowson would initially have been owned by whoever paid for the building of the church. Later, the advowson could change hands, being inherited or sold like other property. The owner of the advowson would present the candidate to the bishop. The candidate rector would pass various hurdles (qualifications, references, etc) and be approved by the bishop. Before the dissolution, candidates had to gain the approval of the pope. 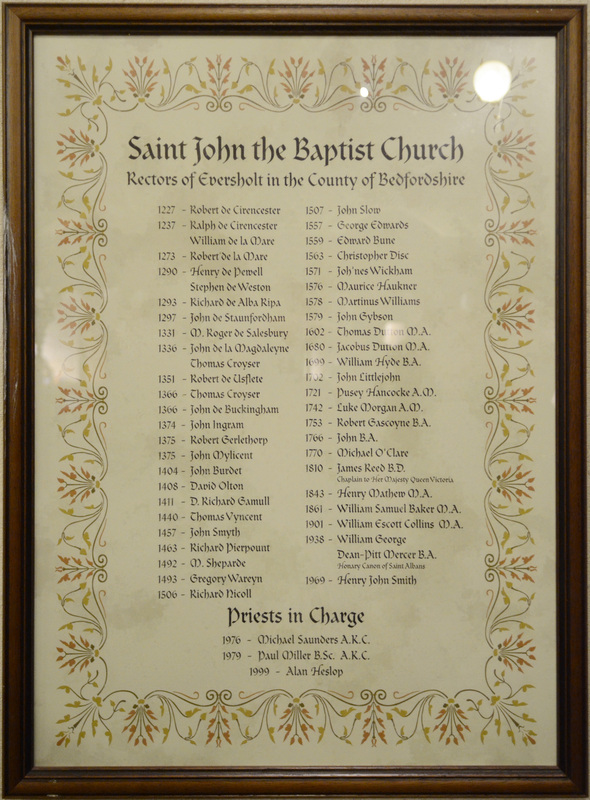 Newly appointed rectors had to pay the first year’s income from the parish to the church. Only when all this had been agreed could the candidate be instituted as rector. Some candidates never actually became rector. a list made by the Bedforshire Records office mostly in the 1950s and updated since. This list is not very intelligible. If anyone would care to explain it, please do. 1331-03-13 (Julian) M. Roger de Salesbury Leonard de Tybertis, prior of Hospitallers. 1557-08-18 George Edwardes [or George Edwards] Thomas Johnson, by reason of an assignment made to him by Robert Rowley, William Aprice, William Smythe and Thomas Warde by virtue of the advowson made to them by the prior and convent of St. John of Jeruslaem and the ‘confrater’ of the same. ? 1558-08-03 John Ramrydge Fulk Merton, gentleman, by reason of an advowson made to him by John, Earl of Bath and Margaret, his wife. 1576-07-19, presentation 1575-07-15 Maurice Haukner [or Faulkner or Fawkener] St John’s College Cambridge? 1642-01-26 Theodore Dutton [or Teodorus] Johannes Russell Esq. Died. “Natural death”! 1900-11 William Escott Collins M.A. 1938-05 William George Dean-Pitt Mercer B.A. Here’s a picture of the poster from the church (click for a bigger version) but I have no idea what the copyright status of a poster displayed in a church is, so this image had better remain copyright, please. Some recent appointments have been as a “priest in charge” rather than as a rector. According to wikipedia, a priest in charge doesn’t have responsibility for maintaining the church, and doesn’t get the money due to the rector. Presumably, they’re paid by the diocese. The current person, Steve Nuth, has returned to being rector. Henry de Pewell, shown int he poster as rector in 1290, seems to be a misprint. Everyone else has him as Henry de Sewell. Michael O’Clare, shown in the poster as rector in 1770, wasn’t actually a rector, but was a curate. That’s a sort of apprentice vicar. There were lots of curates in Eversholt over time, most of whom are not recorded. John Littlejohn in 1702 was a curate. One may have been E H Whinfield who gave a guinea to support a Sunday school society in 1785. The poster is incomplete – Thomas Dutton seems to have held the post for 78 years. It’s remarkable to discover that, quite a long way down the list, M. Sheparde was appointed in the same year that Columbus sailed to the West Indies. There must have been quite a few upsets during all the religious upheavals of the 1500s, changing the national religion from Roman Catholic to CofE and back again and back again, but that’s not obvious from this list. There is a list of some rector records. There’s a mention of one Gilbert de Eversholt as a rector earlier than this. The evidence so far seems slight; however, it’s quite interesting!